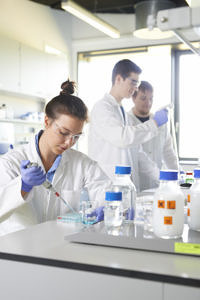 The Research Laboratory training emphasises the research focus of the degree programme. It is not an industry internship but is usually conducted at the university. The Research Laboratory module is meant to be a miniature master’s project in oder to prepare you for your final master’s thesis. Therefore, you have to find a project and a supervisor at one of the chairs at the School of Engineering. For a start, it is always a good idea to have a look at the chair’s website. But don’t be afraid to contact the staff directly and ask whether you can participate in a project they are working on. Projects at the School of Science or the School of Medicine are only possible if they have a clear focus on medical engineering. Please contact your study advisor for more information if this is your case. All information on the procedure and content of the Research Laboratory can be found in the English Module Description. At the end of the Research Laboratory you must summarize your research in an academic paper (4-6 pages). Please be aware that your supervisor has to fill out the Certificate of Research Laboratory to confirm your successful completion of the module. Please submit this form to the Examinations Office. The Research Laboratory´s subject is assigned by an academic supervisor of the School of Engineering and will be processed at their department -if the supervisor agrees in cooperation with external parties. The workload consists of 150 hours (equivalent of 5 ECTS points). The Research Laboratory training can be completed during the regular lecture period (e.g. one day per week) or during the lecture-free period (semester break). External partners can be businesses, i.e. you can combine your Research Laboratory with an Industry Internship if it meets the requirements of the module description. In any cases it is your duty to find a supervisor at the School of Engineering who will take academic responsibility for your Research Laboratory and sign your certificate (more information below). 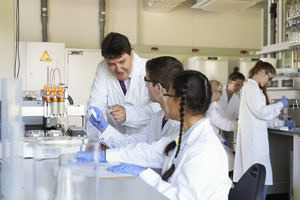 If you study a semester abroad the Research Laboratory is a favourable academic achievement to conduct. However, the certificate has still to be issued by an academic supervisor of the School of Engineering at FAU.